Today True North Trout reviews the second in our line of angling shirts — the Bonehead model by Columbia Sportswear. The shirt comes in both long-sleeve and short-sleeve versions, and the short-sleeve version goes for about $36.00 retail. The Columbia Sportswear Bonehead is made from a 100% cotton ultralight poplin fabric, which is comfortable and breathable. I think it is absolutely a perfect choice for the tropics and on hot days in Northern Michigan, as well. I find the fabric to be an absolute pleasure on warm or windy days in Florida in early spring, and I because I own a number of these shirts, I find myself packing most of my collection for my regular trips to Florida in February and March. 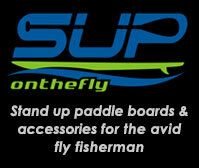 I also wear them on my driftboat in August when I am fishing the lower Au Sable. My one complaint with this particular fabric is the ease with which it wrinkles. I find that when I take these shirts out of the dryer that they are frequently a mess and need ironing to look right. The pocket flaps in particular are bad — usually they need quite a bit of work to get them to lay-down right. I would say that of all the fishing shirts out there that I have tried, these are the ones most in need of work with an iron when they come out of the wash. The thing to keep in mind with the entire Columbia Sportswear line of fishing shirts is the fact that they are sized quite a bit on the large side. I’m one of those people who straddle traditional sizing models. With one manufacturer I find that the large size is perfect, and with another I find that I need the extra-large. But with the Columbia line, it is ALWAYS the large — and I find that sometimes I wish I could completely fit in the medium. Overall, the “large” fits me well enough, but in wind on the flats the shirt tends to balloon out quite a bit due to the fact that it is extra-roomy in both the torso and the arms, and I wish it was cut a bit less roomy overall. The one thing that is nice about this sizing model comes in the area of the shirt tails. Most shirts I buy tend over time to get untucked simply because the tails are not long enough, but this is not a problem for the Columbia Bonehead — the tail stays tucked all the time, which I like. One problem with most tropical flats fishing shirts is that the designers spend too much time trying to figure out ways to stick more and more pockets on the shirt. This is a bit silly as saltwater angling is either done (a) from a boat, in which case a bunch of pockets are unnecessary because all your gear is stored in the boat, or (b) from your feet, in which case you’ve got a fanny pack or a chest pack that holds your gear because you don’t want the bulk of it moving around in your shirt when you’re casting. In either case, all those balloon pockets are a bit of overkill, in my view. The Columbia Bonehead, to its credit, does not have this problem. It has a nice range of storage options but none of it is overkill, and the shirt has a nice clean look with a minimum of unneeded storage spots to clutter-up the front of the shirt. It does sport a bit of Velcro for rod holder patch — the most useless accessory on a shirt, in my view — but also includes spots to hang saltwater and freshwater flies, along with a fully-vented back. Very nice. Overall, I give high marks to the Columbia Bonehead when it comes to quality. The stitching is excellent, the buttons are of good quality and fastened on well, and the corners on the pockets are reinforced. I’ve put my shirts through the wash a number of times and they come out looking great with little fading and are mechanically in excellent condition. 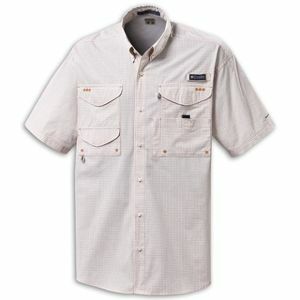 The Columbia bonehead comes in both long-sleeve and short-sleeve models. The long-sleeve model comes with integrated tabs to make it easy to roll-up the sleeves. It comes in about ten colors, most of which are more appropriate for saltwater anglers. Columbia recently added the “Super Bonehead Flats” line which brings prints to their offerings, too. Because these shirts are so widely available, and available outside of traditional sporting goods venues, it is easy to write them off as not being of good quality. I have found, however, that the opposite is true — setting aside the problems of fit, I think of these shirts as excellent choices particularly for saltwater angling adventures. Note: This is the second in a four-part series of reviews on popular fishing shirts, with a focus on their fit, functionality, quality, and appearance. Look for upcoming installments in future weeks.